In 1983 in a sleepy small town called Jõgeva in Central Estonia without even a single traffic light at the time, a little three-year-old boy named Joel Juht found himself in a dance class with his older sister. He, indeed, found himself there – similarly to many other great stories, it all began with a single small step. They immediately tricked the first dance moves out of the small boy with a mere delicious slice of cake. But it was out of the given steps and his childhood dreams that JJ-Street Dance School was later born. This is the story of the birth and fulfilment of Joel’s dreams. 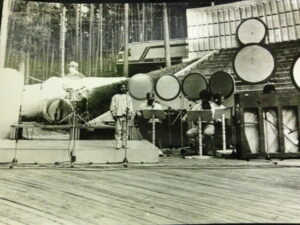 Joel got his very first feel of stardom when performing at the national singing competition Laulumaias in Võru. He was six years old. In addition to his first performing experience and the opportunity to get over his stage fright, Joel discovered the taste of the indescribable feeling of doing something that you really enjoy. The satisfaction stemming from the achievement of something new, great, beautiful and enjoyable was utterly justified. Namely, Joel didn’t do very well at school and he was better known for his ‘bad boy’ image trying to attract attention with his constant pranks. Things weren’t much better at home either. And it was precisely due to the complicated issues at home that he had to make extra efforts to get the attention that he yearned for. So he took up sports, dancing and many other hobbies. As there were few boys and young men actively dancing at the time, the only way for Joel to seem manlier and stand up for himself was to take up a tougher sport. And so he chose wrestling. However, the given sport equipped him with the spiritual and physical balance to continue also with his favourite hobby – dancing. Joel had numerous dreams but his main aim was to be known in Estonia for his dancing. It wasn’t a simple goal to reach as Joel felt that the biggest obstacle on his way was his rural background. His rise to stardom had been greatly inhibited by the lack of appropriate conditions in the small town environment. The word that Joel mainly heard used about him was “impossible”. However, he wasn’t intimidated by it. 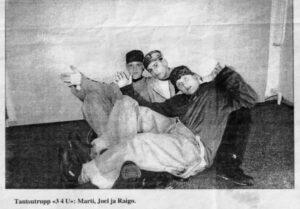 In 1994, a year after Joel had begun to drive regularly 50 kilometres to the city of Tartu for his dance rehearsals, he and his two friends decided to form the first hip hop dance group in Tartu named 34U (Three for You). The given group toured all over Estonia seeking fame and popularising the hip hop style. Joel’s strong will wasn’t even discouraged by the fact that in order to remain a full member of the first Estonian hip hop dance group, he often needed to spend hours hitchhiking by the road from Jõgeva to Tartu. Similarly, he will never forget the nights on the couch of the smoky nightclub in the suburb of Annelinn in Tartu, as it wasn’t always possible to get back home after the late night performance. Looking back at his experience today, Joel stresses the role of parents in supporting their children in pursuing their dreams and efforts. Unfortunately, not every person has the same stamina and so it happened that the group 34U soon dissolved with only Joel continuing in dance. As a result, the first hip hop dance rehearsals came to be conducted in 1996/1997 in Virtuse sports hall in Jõgeva. Due to the limited conditions, there was no current information on street dance available with only a few rumours about the break style hovering in the air. And owing to the fear of strange new things, the first efforts were not really successful. But once again Joel decided to prove that he would make it and his dream was not impossible. And he continued to strive for it winning various dance competitions and doing the choreography for famous singers in Estonia and later also abroad. He similarly starred in various films and even issued two singles in 2004 and 2005. The year 2003 turned out to be very important for Joel, perhaps due to his friend Õnne who used to work as the manager of the former City Squash (at present Valge Maja) building and suggested that Joel started as a dance trainer there. It didn’t take long to convince Joel and he began his trainings again already in the same year. Although at the time there had been no special hip hop trainings, Joel had no ambitions to start his own dance school – he only wanted to rehearse and dance with somebody. It was largely thanks to a chance encounter with an old school friend in Tallinn that we now have JJ-Street Dance School. However, the road to his dream was not without further obstacles. The first dance practices took place in a room without any mirrors. “At first there were only three people with the music coming from a small recorder, but soon there were already loads of people coming and going and even the security guard was quite baffled,” Joel recalls. He will never forget the first practice with only three girls with Joel in the squash court as he was more than certain that it would probably remain like that forever. In two months, however, the facilities were so crowded that in order to have enough space for dancing together, the first Estonian hip hop practices had to be moved to the sports centre of Tallinn Technological University. Two years on and they had to move again, this time to Kopli, but that did not discourage the young dancers one bit – Joel was no longer alone in his desire to dance. The keen enthusiasm and growing popularity brought about another concern – they had no name. The present name JJ-Street Dance School originates from Tartu Road. Joel assigned the task to three young and active girls Ita, Moonika and Diana on one condition – it had to contain Joel Juht’s stage name JJ. The girls only added one word – street (as it is all about a street dance) – and thus the name JJ-Street was official. And soon the facilities grew once again too small to accommodate all the dancers and they had to find a new place. After all the moves, an opportunity arose to establish the JJ-Street Dance School studio in the old town of Tallinn and Joel was faced with a difficult dilemma – whether he should finally buy a home for himself in Tallinn or invest every penny in his dream and dance school instead. Joel obviously chose the school and ended up living in the studio and sleeping in the office with a huge dance hall on the other side of the wall. There was no shower room, the studio front room and kitchen became his living area with the dirty laundry kept in the girls’ changing room. And privacy, of course, was merely a distant dream. Then again, there was never any real doubt about whether he should establish the dance school, the only reservation came from the fact that Joel found no support whatsoever – even long conversations with authorities and dance sessions with mayors only resulted in questions such as “What on earth are you doing?” As soon as he replied that he was promoting street culture and dance, it became evident that people primarily harboured the misconception of a group of small potatoes. It took years of hard lobbying until nothing was “impossible” any more – the word that Joel had heard so often in his youth was now firmly in the past. Coming from a small town himself, Joel has considered it as his mission to help as many small town youngsters as possible by providing them with the latest information. In his attempts to raise the awareness of street culture he spent almost ten years travelling from one end of the country to the other. All the travelling came at a price as in addition to everything else, Joel had to forgo all Christmas and birthday parties, meeting friends, going on holidays and many other conveniences. He couldn’t join in the fun of his peers nor could he afford to enjoy anything that a young person actually needs. Apart from conducting dance trainings, spreading the national dance bug also meant a lot of explanations, listening to young people’s problems and also struggles with the local dance groups sensing the competition by JJ-Street. Many local dancers decided to join the new dance school with a more innovative approach instead thus creating a lot of jealousy and bad blood – in some cases even the dance school posters came to be torn down in hatred. Despite all the hatred, Joel kept up his positive mindset and refused to quit, although there were times when driving home could be so dangerous that he had to sleep at the fuel station on the highway and reached home only at 3 or 4 o’clock in the morning. He then crashed onto his bed only to start all over again in the morning. The longest drives from Tallinn to Tartu or even to Tõrva accounted for hundreds of kilometres and robbed him of years of precious sleeping hours. But Joel never gave up although nobody in his wildest dreams could have imagined that the few students could one day develop into one of the largest youth organisations in Estonia. Today we see the result of all the brave moves. The long and painful journey has reached its destination and the refusal to quit over the past 12 years has taken JJ-Street Dance School into its own two-storey building in Tallinn with all modern conveniences that they could once only dream of. Today the team of JJ-Street Dance School may boast with a fresh vision and a list of impressive accomplishments. The dancers have found their calling both in Estonia and abroad with all taking pride in their one big family. The little ugly ducklings have grown into professional dancers and excellent role-models for youngsters. JJ-Street is the only Estonian dance school educating professional street dancers and providing youngsters with the unique opportunity of combining their hobby and work. There are no other organisations promoting the Estonian street culture at the given level and bringing top world legends to perform in Estonia. Today, JJ-Street has become an international brand cooperating with various dance organisations all over the world. Similarly, JJ-Street is a partner of the largest Estonian street culture festival JJ-Street Baltic session. It is an organisation promoting Estonia all over Europe and even further! The phenomenal aspect, however, is that everyone has the chance to aim higher and make his visions a reality. JJ-Street Dance School allows you to fulfil your dreams – it’s impossible not to be successful here. JJ’s story is a great story of how compassion and perseverence can guide you anywhere to live in happiness. He is a well known dancer in europe. Besides learning his craft he is very good in cooperation and a nice guy to hang out with. He gathered a good team around him that steadily builds for a bright future of the dance forms coming out of the urban. I personally worked with JJ and his companions on many occasions. Even though it was hard work, the look at the outcome always made it a pleasureful experience. It was good to read the story of JJ and his long road to becoming the success he is today! There is a lesson that anyone can learn from here because it’s filled with inspiration. Never give up your dreams. Where there is a goal and determination. A way will be shown for you. It’s just a matter if you have the guts to stick it out through the ups and downs. He did and he succeeded. Congrats Joel. Your a credit to hip hop, your city and country.